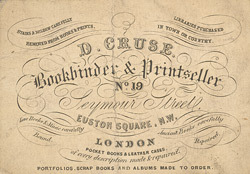 This leaflet is advertisement for D. Cruse, bookbinder and printseller. The 19th century is sometimes called the ‘golden age’ for jobbing printers. There was an enormous demand for their services with printer being required to produce a range of materials from tobacco wrappers and leaflets, to theatre programmes and political tracts. An infinite variety of typefaces and ornamentation could be used and often printers trade cards used combinations of as many different styles as possible to advertise their skills.